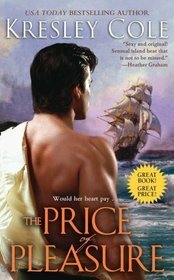 Kresley Cole’s The Price of Pleasure is the companion story to the Captain of All Pleasures. It’s a historical romance set at sea, featuring the dashing and stalwart captain Grant Sutherland. Grant is on a mission to find the lost family of an old nobleman. The family has been missing at sea for 8 years, and if Grant finds success, he will inherit the old man’s estate. After months of searching, Grant finds the one remaining member of the family, the beautiful Victoria, and her friend Cammy. Everyone else who had been aboard the ship, died when it went down in a storm. The survivors lived alone on a tropical island.. having no contact with the outside world, except for a few ill-meaning sailors who had crossed their path. Victoria doesn’t trust Grant at first, but she can’t ignore her curiosity or her attraction to him. At the same time, Grant fights his urges to be with Victoria, believing he has a duty to be a gentleman with her. He is destined to lose that internal battle… on several occasions. Grant gets the women off the island and the ladies quickly befriend his cousin Ian. Cammy is dealing with a mysterious illness and Victoria… well, she is determined to have Grant. She finally wears down his defenses, but the man has some serious issues. It makes it hard to like him, because I mostly just wanted to kick him in the shins for being an idiot. Life gets even harder for Victoria when she returns to London. And Grant’s stupidity reaches new heights. He doesn’t deserve her. But when he finally realizes the error of his ways, he is somewhat redeemed. Kresley Cole is the queen of hot love scenes and that is true here as well. Big points for that –and even more points for the reappearance of Derek and Nicole. Sadly, I must subtract points for the hanging plot surrounding Ian. I got the impression it was a set-up for another book that never came to fruition. Not quite as good as its predecessor, but still a good read.